This Gleansight benchmark report is based on the experiences of 387 companies and includes the following sections: Reasons to Implement, Challenges, Value Drivers, Core Technologies and Success Story. It also includes a Vendor Landscape with descriptions, rankings and analysis of 39 solution providers. 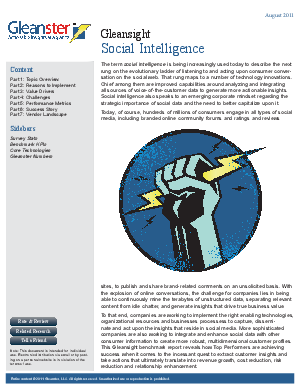 Social intelligence is being increasingly used today to describe the next rung on the evolutionary ladder of listening to and acting upon consumer conversation on the social web. That rung maps to a number of technology innovations. Chief among them are improved capabilities around analyzing and integrating all sources of voice-of-the-customer data to generate more actionable insights. Social intelligence also speaks to an emerging corporate mindset regarding the strategic importance of social data and the need to better capitalize upon it. This Gleansight benchmark report reveals how Top Performers are achieving success when it comes to the incessant quest to extract customer insights and take actions that ultimately translate into revenue growth, cost reduction, risk reduction and relationship enhancement.